Hotel COOEE Albatros is located in Moraitica, one of Corfus oldest and most picturesque villages. At the 2 km long beachside, you can enjoy a clean and blue shallow sea, which is ideal for families with children. Moraitica has also a very active nightlife with numerous restaurants, taverns and also bars and dance clubs. Right next to Moraitica there is the old fishing village of Messoghi; with the river of the same name as a natural border. Beautiful fish tavernas and relaxing walks at seaside complete the picture. In the inland you can visit the serbian Cemetery – a Monument of Serbian troops from the First World War – and just above it the medieval fortress of Gardiki. The tour continues to the unsurpassed beauty of Lake Korission and its unique cedar forest with a rich flora and fauna, where you can walk in the sand dunes of fine golden sand. 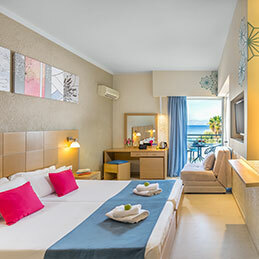 There you can enjoy a majestic sunset or swim in the crystal-clear waters of the western coast of the region at the beaches of Prasoudi, Chalikounas, Paramonas, Aghios Georgios, Issos and Marathias. Another attraction are the traditional villages Clomos, Aghios Dimitrios and Aghios Mathaios perched high in the mountains, with old beautiful churches, chapels, monasteries and hiking paths for walkers and mountain bikers, which together constitute a peerless holiday location. A few kilometers further to the North after the old fishing village of Benitses, the road leads to the village of Gastouri, where the famous Achillion is built – the Palace of Empress Sissi of Austria – with its wonderful sculptures, paintings and gardens of unique beauty. Achilleion is one of Corfus biggest sightseeings and always worth the visit. The location of Corfu in the northen Ionian Sea and the typical moisty-warm climate contribute to the popularity and uniqueness of the island. Due to its location, clear days and sunshine are almost guaranteed during the summer months. From Corfu town (or the airport or the port) drive south on the Corfu- Lefkimmi street towards Lefkimmi and after 18 km you will enter Moraitica. At the end of Moraitica comes a crossroad with a traffic roundabout and there you take the third exit, which is the road to the beach. 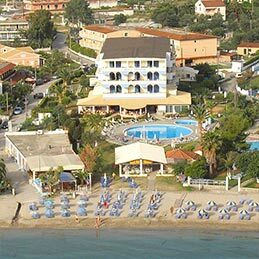 Hotel COOEE Albatros is located near the end of the road right on the beach. From the port of Lefkimmi drive towards Corfu town and after 17km you will reach Moraitica. At the traffic roundabout take the second exit, the road to the beach. Hotel COOEE Albatros is located near the end of this street right on the beach. Cost of travel by taxi from Kerkira or Lefkimmi is about € 37,00. From the new central bus station (green buses) about 500 m of Kerkira you can take all buses to Messonghi, Kavos, Ag. Georgios and Issos. The bus stop in Moraitica is placed at a traffic roundabout and you have to take the third exit and walk for about 200 meters on the road to the beach to reach Hotel COOEE ALBATROS. A sign shows you the road you have to take. Journey 45 minutes – Bus tickets cost € 3,00. To the seaside of COOEE Albatros one can find the swimming pool with jacuzzi, a playground and the COOEE Bistro. 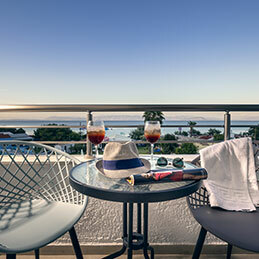 Discover Hotel COOEE Albatros and Corfu Island through our photo gallery.